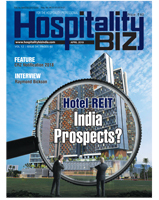 Hospitality Biz has become a reliable source of information for individuals, businessmen and hoteliers etc who want to know about upcoming projects, current affairs and new trends in hospitality segment. With over 36,000 plus visits per month and over 47,000 registered users, we are a trusted online database on hospitality segment. Our visitors comprise hoteliers, promoters, consultants, vendors, chefs, hotel suppliers etc. With our current audience profile, you can reach your target audience and be assured of successfully achieving your business goals. Promote your organization or project on our portal and get high visibility and brand awareness.